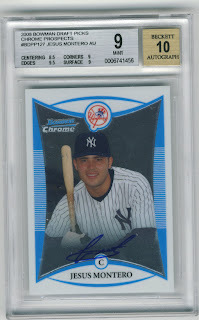 A week ago I challenged everyone to find me a 2008 Bowman Chrome Jesus Montero RC AU for $50 and only one person came close. The only problem I had with the one close to $50 was that I wasn't crazy about the centering on the card (oh and I was sleeping when it ended). I started clicking on the people selling raw Montero cards on eBay to see what else they were selling and the majority also had graded ones for sale. Some sellers even had words eluding to them collecting or selling mint cards or graded cards. This made me fairly certain of one thing- they were all selling sub-par quality cards raw to flip quick. I'm all for that, but I just don't want a card that the centering is 70/30 for example. While I would love a BGS 9.5 for my collection, the reality is that I don't plan on collecting Montero other than what I pull from stuff or trade. I have enough going on with my PC as it is and the last thing I need is some other expensive player jumping into my binders. So there you have it, another Scooby mystery solved.